So like, Friday evenings—the first evening at home I get all week, so I really like to stay in—I've been stopping by the Jewel on the way home and picking up a piece of salmon to make salmon and broccoli for dinner. I had been keeping a container of chopped parsley in the freezer, which I'll probably go back to when I go back to making egg bites for breakfast, but last week I had no parsley, so I bought a bunch, washed, trimmed, and whizzed it in the food processor with a smashed and peeled head of garlic and just enough olive oil to get it moving. 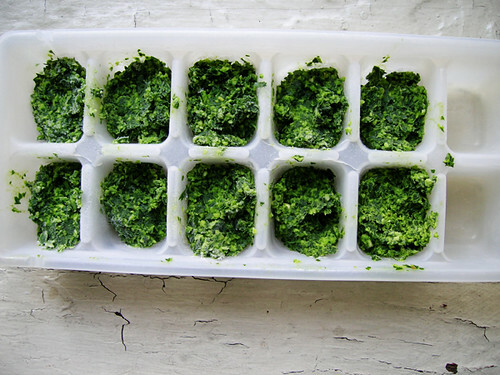 I used some for that night's salmon, and spooned the rest into a spare ice cube tray, not one that I use for making ice cubes, into the freezer and voila, persillade cubes. So now I have enough cubes to use for five more salmon dinners, two per dinner.